Most hand infections are bacterial and are the result of minor wounds that have been neglected. Human bite wounds are the second most common cause of hand infections. Hematogenous spread of infection from other sites to the hand is rare but can occur. A complete history and physical examination is necessary to exclude other associated medical conditions (eg, diabetes, arthritis, immunosuppression  ) that may compromise therapy. The history should ascertain the mechanism of injury, as this may provide some clues about the organism(s) most likely responsible for the infection. Radiographic evaluation may be indicated if the history and physical examination suggest a possibility of fracture, osteomyelitis, or foreign body. Patients with diabetes mellitus, immunocompromised patients, IV drug abusers, and homeless individuals are predisposed to MRSA infections. Eikenella corrodens, an anaerobic gram-negative rod, is part of the normal human oral flora and is recovered in many human bite wounds in the hand. Pasteurella multocida, a facultative gram-negative anaerobe, is recovered from many cat and dog bites. Mycobacterium tuberculosis is responsible for a small percentage of acute and chronic hand infections. Mycobacterium marinum is found in warm water environments and is responsible for some infections in people who come in contact with marine life, boating equipment, piers, fish tanks, and swimming pools. Other bacteria that have been cultured from hand wounds include enterococci, Neisseria gonorrhoeae,Escherichia coli,Pseudomonas aeruginosa, and Proteus mirabilis. Gram-negative organisms are frequently cultured in patients with diabetes and in those who abuse intravenous drugs. Most cultures from hand infections show multiple organisms. In most cases, the diagnosis of infection is made on clinical grounds. Diagnostic studies are frequently necessary to support the diagnosis. If the diagnosis is in doubt, diagnostic studies may be of benefit. Complete blood count (CBC) may reveal leukocytosis with left shift. Serum glucose levels may be helpful, particularly in patients with diabetes. Plain radiographs may be helpful to rule out fractures, foreign bodies, and osteomyelitis. The presence of gas on radiographs suggests the presence of gas-forming organisms, such Clostridium perfringens. In the presence of obvious purulent drainage, perform wound cultures. In suspected septic arthritis, joint aspiration helps confirm the diagnosis and identify the organisms involved. Use caution in aspiration of joints through infected tissues, as this may result in inoculation of the joint space with organisms. Ultrasonography may help confirm the clinical suspicion of abscess, septic arthritis, or pyogenic flexor tenosynovitis. CT scan, MRI, and bone scan may be used to diagnose osteomyelitis. Tzanck smear is useful when the diagnosis of viral infection is suspected in the presence of a blister that has not resolved spontaneously. Paronychia is the most common type of hand infection. It is characterized by erythema, tenderness, and swelling of the nail fold ("paronychia" means "around the nail"). Purulent drainage from the nail fold may occur in advanced cases. S aureus is cultured most frequently from the drainage. 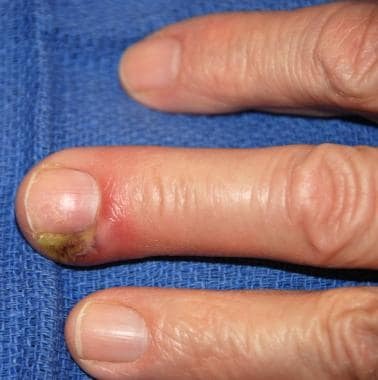 Classic presentation of a paronychia, with erythema and pus surrounding the nail bed. In this case, the paronychia was due to infection after a hangnail was removed. In the early stages, administration of antibiotics may abort the development of an abscess. If an abscess is present, it can be drained by elevating the eponychial fold from the base of the nail, irrigating with saline, and packing the fold with gauze. The packing is removed 24 hours later. For a detailed and illustrated description of this drainage, see Medscape Reference article Paronychia Drainage. Cellulitis presents with rubor (redness), dolor (pain), calor (warmth/heat), and functio laesa (loss of function). Lymphangitis characterized by red streaks up the arm may develop. In more advanced cases, epitrochlear and/or axillary lymphadenopathy may be present. Beta-hemolytic streptococci and S aureus are the usual pathogens. A felon is an infection of the soft tissues at the volar pad of the terminal phalanx. The soft tissue of the fingertips is divided into multiple compartments by vertical fibrous septa extending from the dermis to the distal phalanx. 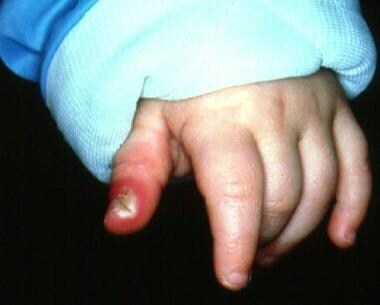 Infections in this area thus mimic a compartment-like syndrome. A hot, red digital pulp implies the presence of pus and should be drained even before the pus is apparent. These septa must be ruptured to adequately drain the felon. Most felons are the result of a relatively innocuous puncture wound, such as a needle stick, in patients with diabetes. The history and examination should include a search for a foreign body, which can occasionally be detected radiographically. S aureus, streptococci, and anaerobes are responsible for most felons. Gram-negative organisms have also been reported, especially in immunosuppressed patients. The infection progresses rapidly, with swelling, tenderness, and erythema presenting within 24 hours of the injury. The cellulitis usually progresses to an abscess if untreated. In the evaluation, wound cultures and radiographs should be obtained to exclude fractures or foreign bodies (eg, teeth). Bites from cats and dogs are much less likely than human bites to result in infection. Cat bites are less frequent than dog bites but are more likely to cause infection. Animal bite wounds can be closed loosely after debriding the wound edges, provided that they are seen early, thoroughly irrigated, and followed very closely, and that oral antibiotics are administered. Advanced cases require intravenous antibiotics. A web space abscess may develop from an infected callus on the volar side of the distal palm. The abscess may spread to the dorsal aspect of the space, resulting in a "collar-button" abscess (see the image below). The patient presents with pain, swelling, and tenderness in the involved web space and distal palm. The fingers adjacent to the web space are abducted from each other. "Collar-button" abscess with volar incision. The midpalmar space is a potential space between the middle, ring, and small finger flexor tendons and volar interosseous muscles. It extends from the hypothenar muscles ulnarly to the midpalmar septum radially. The accumulation of pus converts this potential space into a true space. The infection usually results from direct open trauma, or it may spread from a pyogenic flexor tenosynovitis. S aureus and streptococci are cultured most frequently. Radial to the midpalmar septum is the thenar space, which is also a potential space. This space is volar to the adductor pollicis muscle over the second and third metacarpals. It also can be expanded by the accumulation of pus, which is characterized by painful swelling in the thenar space, loss of palmar concavity, and passive abduction of the thumb. The hypothenar space is a potential space within the fascia of the hypothenar muscles. Infection within this space is rare. It manifests as tenderness and swelling over the hypothenar region. Not all the signs may be present. When the diagnosis is in doubt, ultrasonography or aspiration of the flexor sheath may help in determining the diagnosis. The infection results from direct penetrating trauma but may also migrate from adjacent structures. It may spread to the thenar and midpalmar spaces if untreated. The small finger flexor sheath communicates with the ulnar bursa at the wrist and may allow spread of the infection into the distal forearm (into the space of Parona). Similarly, the thumb flexor sheath may spread the infection to the distal forearm via its communication with the radial bursa. Delay in treatment of pyogenic flexor tenosynovitis can result in a stiff, painful finger as a result of the destruction of the tendon and flexor sheath. S aureus is cultured most frequently, although hematogenous spread of N gonorrhoeae has been noted when history of trauma is absent. Septic arthritis may result from local extension of another type of hand infection, most commonly flexor tenosynovitis, or it may be the primary site of infection. When it is the primary site of infection, osteomyelitis may be caused by penetrating trauma or hematogenous spread from a distant site. S aureus and streptococci are the most frequently cultured organisms, except in bite wounds. The patient presents with a tender, edematous, erythematous joint. Active and passive joint motion is severely limited and is very painful. Arthrocentesis can be performed to obtain cultures and confirm the diagnosis. Spontaneous onset of a low-grade monoarticular arthritis characterized by redness, swelling, minimal heat, and mild pain is characteristic of N gonorrhoeae. Like septic arthritis, osteomyelitis of the bones of the hand can result from local extension of other hand infections, or it may be caused by hematogenous spread from a distant site. Most occurrences result from local extension. Staphylococci and streptococci are cultured most frequently. Haemophilus influenzae is cultured frequently in children. Osteomyelitis presents with pain, erythema, and edema over the involved bone. Plain radiographs may reveal osteolysis, osteosclerosis, or formations of a sequestrum (necrotic bone). Bone scans, CT scans, MRI, erythrocyte sedimentation rate, and C-reactive protein levels may also help in establishing the diagnosis, and should be correlated with clinical findings. Bone biopsy may be performed to obtain cultures. Necrotic bone should be debrided at the time of biopsy. Treatment should be initiated promptly to prevent destruction of the articular cartilage. Among the acid-fast, gram-positive mycobacteria, M tuberculosis is the most common cause of hand infections. The infection most commonly affects the flexor tendon synovium, although bones and joints also may be affected. The presence of a chronic, granulomatous, open lesion or a firm, painless nodule around a joint should arouse suspicion. Biopsy is required for definitive diagnosis. M marinum is found in aquatic environments. Infection usually results from a skin penetration in the hand in people who are in contact with marine life. [9, 10] The injury is often so minor and the symptoms so slow in onset that the patient may not remember the injury. Patients present with chronic, persistent inflammation around a laceration, or with a small draining sinus tract in the hand. Verruca vulgaris, the common wart, is the most frequent viral infection of the hand. 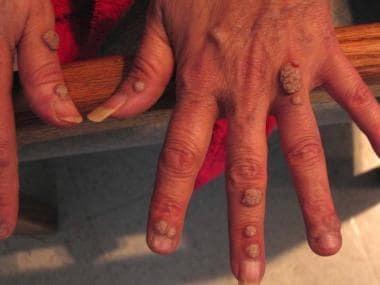 Verrucous warts in a patient with HIV infection. Herpes simplex virus type 1 and type 2 can also cause infection in the hand (herpetic whitlow). [11, 12] The virus is found in the mouth. Children with stomatitis and health care workers (dentists, dental hygienists, nurses, physicians) who come in contact with the mouth are thus predisposed. The infection presents with multiple small vesicles filled with clear or cloudy fluid, which progress to ulcers when the ulcers rupture and drain. The diagnosis should be confirmed with a Tzanck smear, which reveals characteristic multinucleated giant cells. Distinguishing between a felon and herpetic whitlow is important, since incision and drainage is contraindicated for herpetic whitlow. The infection resolves spontaneously in 2-3 weeks, and only supportive therapy is necessary. Herpetic whitlow in an infant with concomitant primary herpes simplex virus (HSV) gingivostomatitis. The basic principles of treating any hand infection include elevation, heat, rest, antibiotics, incision and drainage when pus is present, and tetanus prophylaxis for open wounds. Elevation improves venous and lymphatic drainage and improves the patient's comfort level. Rest makes the patient more comfortable in addition to minimizing the spread of the infection along tissue planes. Heat improves the circulation and leukocyte count to the infected area. Moist heat is more effective than dry heat. Cultures should be obtained, if possible, prior to commencing antibiotic therapy. Antibiotic therapy should be started while awaiting culture and sensitivity studies. The empiric choice of antibiotic depends on the organism(s) most likely to be cultured, based on the history of the injury or other causative factors, and should probably include coverage for MRSA in individuals predisposed to this pathogen. In most situations, a first-generation cephalosporin or penicillin is appropriate until sensitivity studies are completed. In patients with diabetes and in those abusing intravenous drugs, an aminoglycoside or aztreonam can be added to the therapeutic regimen for coverage of gram-negative organisms. Antibiotics are required for 7-10 days for soft tissue infections. Osteomyelitis requires a 4-6 week course of antibiotics. Antibiotics can be administered orally for a felon, paronychia, and dog or cat bite. If an abscess is present, it should be incised, drained, irrigated, and loosely packed. Necrotic tissue that is present should be debrided. In general, the incision should be placed in the area that is pointing. Keep in mind the basic principles of hand surgery for placement of incisions. In a felon (pulp space infection), rupture the fibrous septa by incising on the nondominant border and continuing across the pulp adjacent to the bone to open all of the septal compartments to properly drain the abscess. In chronic paronychia, marsupializing the eponychial fold may be necessary if topical antifungal agents provoke no response. Most incidents of flexor tenosynovitis can be treated by a limited incision and placement of an irrigation catheter. If no response follows, open drainage is indicated. Septic arthritis requires prompt incision and drainage followed by catheter irrigation for at least 48-72 hours. Alternatively, the incision may be left open and treated with delayed primary closure or allowed to heal by secondary intention. Superficial mycobacterial infections can be treated with antibiotics. Synovectomy combined with antibiotic therapy may be necessary in advanced cases. Ethambutol and rifampicin are the antibiotics of choice. Herpetic infection is usually self-limiting and subsides over a 2-week period, requiring only supportive care (ie, rest, elevation, anti-inflammatory analgesics). In immunocompromised patients and patients with repeated infections, an antiviral agent such as acyclovir may be indicated. Fungal infections of the nails should be treated with a topical anti-fungal agent after removing the nail, or with oral terbinafine (Lamisil). Rehabilitation of the hand should begin as soon as the patient is able to tolerate range-of-motion exercises. This may be as soon as 1-2 days after drainage of a felon or paronychia or 3-4 days after open drainage of a pyogenic flexor tenosynovitis. Empiric antimicrobial therapy must be comprehensive and should cover all likely pathogens in the context of the clinical setting. Ciprofloxacin (Cipro) is a fluoroquinolone that inhibits bacterial DNA synthesis and, consequently, growth, by inhibiting DNA gyrase and topoisomerases, which are required for replication, transcription, and translation of genetic material. Quinolones have broad activity against gram-positive and gram-negative aerobic organisms. Ciprofloxacin has no activity against anaerobes. Continue treatment for at least 2 d (7-14 d typical) after signs and symptoms have disappeared. Adult dosing is 500-750 mg PO q12h or 200-400 mg IV q12h. Ciprofloxacin is not recommended in persons < 18 years because of increased incidence of adverse events compared to controls, including arthropathy. Ciprofloxacin is a pregnancy category C drug. Cefazolin (Ancef, Kefzol, Zolicef) is a first-generation cephalosporin. It inhibits bacterial cell wall synthesis. Cefazolin is bactericidal and very active against gram-positive cocci. Adult dosing is 500 mg to 1 g IV/IM q6-8h. Pediatric dosing is 25-50 mg/kg/d IV/IM divided bid/tid/qid. Cefazolin is a pregnancy category B drug. Clindamycin (Cleocin) is a lincosamide that inhibits bacterial protein synthesis. It is produced by 7(S)-chloro-substitution of 7(R)-hydroxyl group of parent compound lincomycin. It inhibits bacterial growth, possibly by blocking dissociation of peptidyl tRNA from ribosomes, causing RNA-dependent protein synthesis to arrest. It widely distributes in the body without penetration of CNS and is protein bound and excreted by the liver and kidneys. Clindamycin is effective against gram-positive cocci and anaerobic gram-negative bacilli (eg, Bacteroides species). It is also indicated for use in penicillin-allergic patients. Adult dosing is 150-450 mg PO qid or 1200-2700 mg/d IV/IM divided bid/qid. Pediatric dosing is 20-40 mg/kg/d IV/IM in 3 or 4 equal doses. Clindamycin is a pregnancy category B drug. Nafcillin (Nafcil, Nallpen, Unipen) is considered initial therapy for suspected penicillin G–resistant streptococcal or staphylococcal infections. Use parenteral therapy initially in severe infections. Change to oral therapy as condition warrants. Due to thrombophlebitis, particularly in the elderly, administer parenterally only for short term (1-2 d); change to oral route as clinically indicated. Adult dosing is 1-2 g IV q4-6h or 250-500 mg PO q4-6h. Pediatric dosing is 50-100 mg/kg/d PO/IV divided qid. In children < 4 kg (neonates), dosing is 10 mg/kg IM bid. In children 4-40 kg, dosing is 25 mg/kg IM bid. In children >40 kg, administer as in adults. Nafcillin is a pregnancy category B drug. Their mechanism of action may involve an alteration of RNA and DNA metabolism or an intracellular accumulation of peroxide that is toxic to the fungal cell. Terbinafine (Lamisil) is a synthetic allylamine derivative. It blocks synthesis of Name ergosterol, an essential component of fungal cell wall membrane. It is mostly fungicidal and effective against most strains of Candida albicans, Epidermophyton floccosum, and Scopulariopsis brevicaulis. It is available as a tablet or cream. Adult dosing is 250 mg PO qd for 6 wk; apply cream bid to affected area. The cream is available without a prescription. Pediatric dosing is not established. Terbinafine is a pregnancy category B drug. Klein MB, Chang J. Management of hand and upper-extremity infections in heart transplant recipients. Plast Reconstr Surg. 2000 Sep. 106(3):598-601. [Medline]. Fowler JR, Ilyas AM. Epidemiology of adult acute hand infections at an urban medical center. J Hand Surg Am. 2013 Jun. 38 (6):1189-93. [Medline]. Olszewska M, Wu JZ, Slowinska M, Rudnicka L. The 'PDA Nail': Traumatic Nail Dystrophy in Habitual Users of Personal Digital Assistants. Am J Clin Dermatol. 2009. 10(3):193-6. [Medline]. Nardi NM, Schaefer TJ. Felon. StatPearls. 2018 Jan. [Medline]. [Full Text]. Zubowicz VN, Gravier M. Management of early human bites of the hand: a prospective randomized study. Plast Reconstr Surg. 1991 Jul. 88(1):111-4. [Medline]. Maniscalco K, Edens MA. Bites, Animal. StatPearls. 2018 Jan. [Medline]. [Full Text]. Babovic N, Cayci C, Carlsen BT. Cat bite infections of the hand: assessment of morbidity and predictors of severe infection. J Hand Surg Am. 2014 Feb. 39 (2):286-90. [Medline]. Giuffre JL, Jacobson NA, Rizzo M, Shin AY. Pyarthrosis of the small joints of the hand resulting in arthrodesis or amputation. J Hand Surg Am. 2011 Aug. 36(8):1273-81. [Medline]. De Smet L. Mycobacterium marinum infections of the hand: a report of three cases. Acta Chir Belg. 2008 Nov-Dec. 108(6):779-82. [Medline]. Tigges F, Bauer A, Hochauf K, Meurer M. Sporotrichoid atypical cutaneous infection caused by Mycobacterium marinum. Acta Dermatovenerol Alp Panonica Adriat. 2009 Mar. 18(1):31-4. [Medline]. De Souza BA, Patel R, Treffene S, Shibu MM. Recurrent herpetic digital infection: establishing a diagnosis and making use of a viral test kit. Plast Reconstr Surg. 2005 Jun. 115(7):2158-60. [Medline]. Betz D, Fane K. Herpetic Whitlow. StatPearls. 2018 Jan. [Medline]. [Full Text]. Brown DM, Young VL. Hand infections. South Med J. 1993 Jan. 86(1):56-66. [Medline]. Kilgore ES Jr. Hand infections. J Hand Surg [Am]. 1983 Sep. 8(5 Pt 2):723-6. [Medline]. McDonald LS, Bavaro MF, Hofmeister EP, Kroonen LT. Hand Infections. J Hand Surg (Am). August 2011. 36A:1403-1412. Moran GJ, Talan DA. Hand infections. Emerg Med Clin North Am. 1993 Aug. 11(3):601-19. [Medline]. Neviaser RJ. Acute infections. Green DP, Hotchkiss RN, Pederson WC, eds. Green's Operative Hand Surgery. 4th ed. Philadelphia, Pa: Churchill Livingstone; 1999. 1033-47. Ong YS, Levin LS. Hand Infections. Plast Reconstr Surg. October 2009. 124:225e-233e. [Full Text]. Patel MR. Chronic infections. Green DP, Hotchkiss RN, Pederson WC, eds. Green's Operative Hand Surgery. 4th ed. Philadelphia, Pa: Churchill Livingstone; 1999. 1048-93. Stevanovic MV, Sharpe F. Acute infections. Wolfe SW, Hotchkiss RN, Pederson WC, Kozin SH. Green's Operative Hand Surgery. 6th ed. Philadelphia, Pa: Elsevier Churchill Livingstone; 2011. 41-84. Massive soft tissue damage of the lower left leg caused by a pit bull attack.